The main grid will not update this week. It stays on version #18.02.12.512536. Blue Steel, Le Tigre, and Magnum get the same update, #18.03.05.513046. This is stated as having ‘internal changes’. Above taken with the 5.1.3.513006 version of the 360-Snapshot Viewer. The main viewer updated this past week and is now version 5.1.2.512803. Previously this was the maintenance version released in week #6. Second Life Love Me Render Viewer version 5.1.3.513005 – This version updates the previous version released in week #9. It adds security fixes and the updates from the promotion of the Maintenance viewer. Second Life Media Update Viewer version 5.1.2.512574 – This is the version released in week #8. Expect it to soon update to include the Maintenance version fixes. Second Life Maintenance Viewer version? Since the last version was promoted and the new version is in QA over the weekend, there is no version out yet as I write this Monday morning. We may see a version by Tuesday when I prep this for publication. 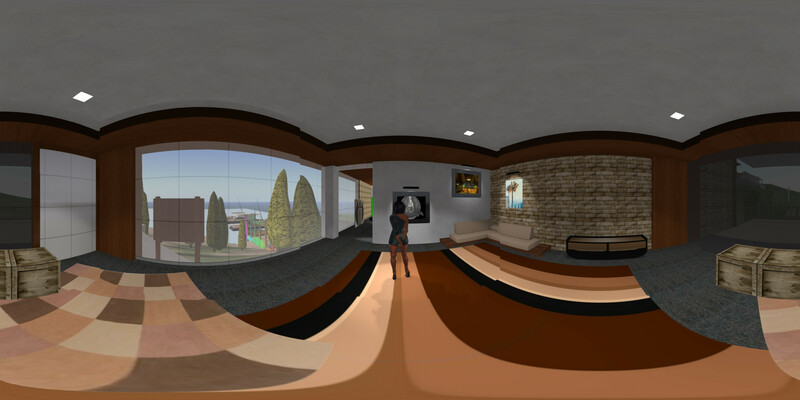 Second Life Project 360 Snapshot Viewer version 5.1.3.513006 – This is a new update. A previous one appeared in week #9. Oz Linden was saying there is another update that uses newer higher rez images to address fuzziness in the resulting 360-images. I am not sure whether he meant this is the version that does that AGAIN, or the previous version was it. So, I installed the version. I had to manually delete my shortcut and install a new one taken from the updated install. Until I did I was in the install loop. Install, launch, install, launch, repeat. Testing I find the output from the previous version and this 513006-version are both 4096×2048. However, the 513006-version image seems sharper. Actually, significantly so. I think I see traces of an image sharping process. But, they may also have used higher rez images and baked them down into the 4kx2k image. Hard to tell. But, I do think it is better. The seams in the image are WAY less pronounced, pretty much invisible. Below is the image I took with the previous version. The WordPress plug-in I use is very blurry. So, click to see the 360’s over on Flickr where they look pretty good. 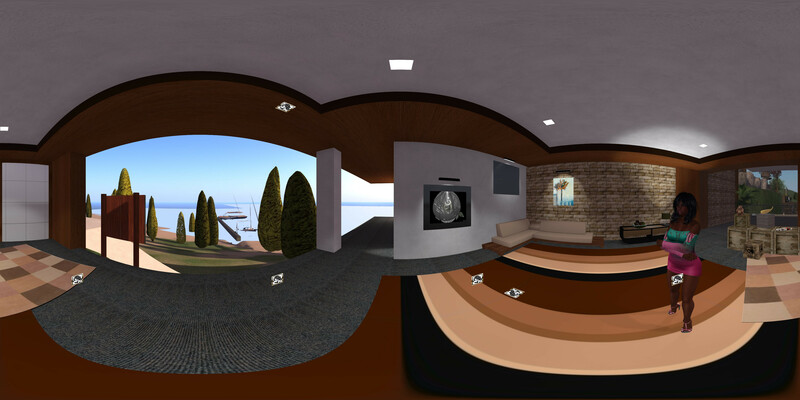 Second Life Project Animesh Viewer version 5.1.1.511908 – This version released in week #4. It is usable in Aditi for those playing with animesh. Vir Linden says Animesh is coming along well. Some viewer bugs are being fixed, 5 or 6. Plus, the Land Impact and Avatar Complexity costs have yet to be determined. They expect to deploy the server-side changes to the main grid, Agni, soon. No planned ETA on that, at least that they are willing to say. I am guessing this month, March. There is a NEW Project viewer that was in QA this past weekend. It is expected to appear publicly this week, #10. It will use the new Bakes-On service and allow mesh attachments to be baked using the 1024 Bakes-On service. This new Bakes-On viewer will work on the main Agni grid. I want to point out we, the users, have had very little interactive input on how this will work. So, with the release of the project viewer, we will be getting our first glimpses of how the Lindens think the service should work. A major reason for the Bakes-On upgrade is the proliferation of onion-skin models, those using multiple copies of the model like we see with avatar bodies and heads. With bodies, there is a model for the skin, another for the tattoos, another for underwear, and yet another for clothes. That is 4 models all that allow the use of multiple 1024×1024 textures. This feature is hoped to reduce the need for onion-skin models. In the video I linked to Monday, at the 04:30 minute mark the question, ‘What about increasing texture memory?’ came up. This is a question about changing the viewer to use more of the video card’s fast memory. The viewer limit is around 2GB and my card has 6GB of video RAM. So…? Oz Linden said he did not want to slow down the release of Bakes-On while they handle the minefield of texture memory. Getting texture memory working well in HD Graphics, ATI, and NVIDIA video card with 1 to 8GB of Video RAM is complex. Plus the just got a programmer with rendering code experience. While there is concern about quadrupling texture use in going from 512 to 1024 with the baking service, it was pointed out that the Bakes-On process would hopefully be replacing multiple 1024’s being used now. So, the change in ‘total’ texture memory usage is expected to go down. Only time is going to definitively answer that question. Enhanced Environment Project aka EEP – will very very soon have a project viewer. Rider Linden got his first EEP objects on Aditi yesterday. He is cleaning up his inventory code now. Next, he will ‘wire in’ the Windlight editors to enable editing the new EEP assets. After that will come the LSL parts. Missing offline group notices – actually missing offline IM’s in general – The Lindens have a project in progress they think will fix the problem. But, it requires an API change. The current backend service sending the notices sends them via UDP to the viewer and the viewer catches them, which allows some to be lost. The new service and API will wait for the viewer to request them and then send them bundled into a package. It is expected to be more reliable as the notice process will change to being under viewer control. The changes are underway now and are expected to arrive in the next couple of weeks. The Lab is making this sort of a solo change… not mixed in with lots of other changes. This is to make it easy for third-party developers to quickly add the change into their viewers. There is a number of new things coming… but they are secret. 11:00 DDoS – Oz wouldn’t add much referring us to the post about the DDoS attack in the SL Forum. He did say they working to harden the system. Also, that some part of the SL system is often under attack. They generally handle it well enough that users never notice. 12:30 Linux – Callum Linden is working on a Linux build. If it is easy, the Lab will release a Linux viewer. But, Callum’s time is limited and they will move him to a new project soon. So, if there are problems, they are unlikely to get resolved and a Linux viewer is unlikely. The project Callum is starting next is part of the move to the cloud. Some parts are there, most aren’t. No one seems to have a good idea what percent of the system is in the cloud. I assume it is still a small percentage.